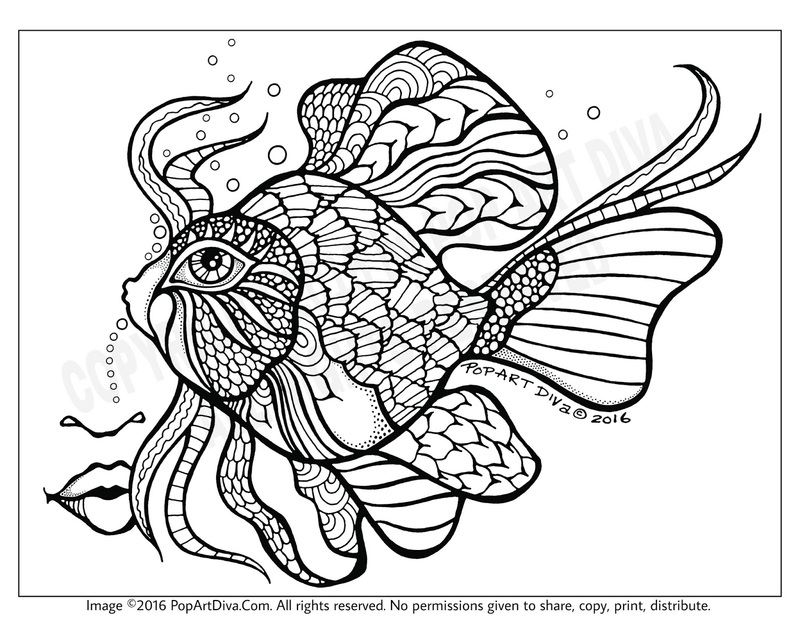 Coloring Pages, Coloring Books and Coloring Art, Posters, Cards, Clothing, Home Decor & Gifts by Pop Art Diva. Hours of coloring fun, therapy and relaxation. 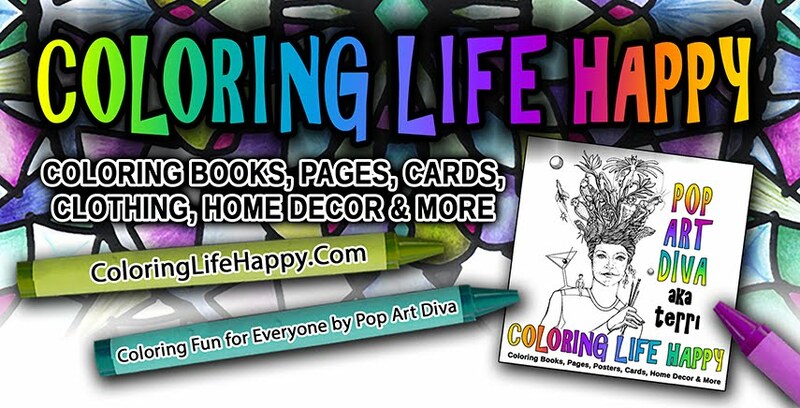 Grab your crayons, Line up the markers and prep those pencils and Color Your Life Happy! 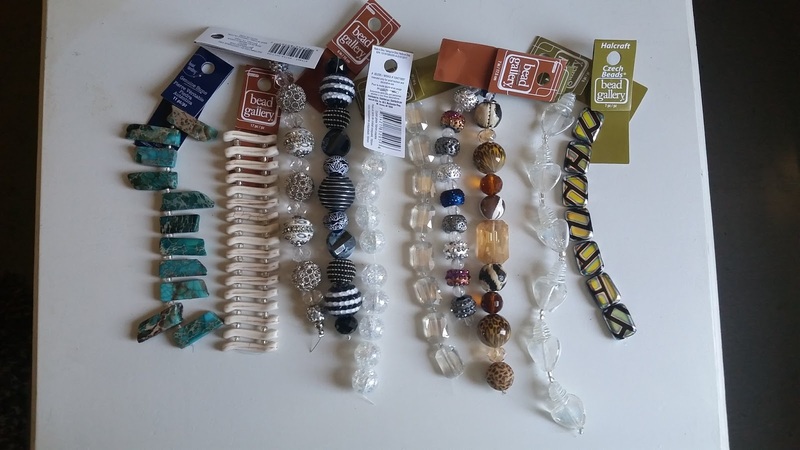 One Of A Kind Wearable Art Necklaces & Cocktail Picks Coming! 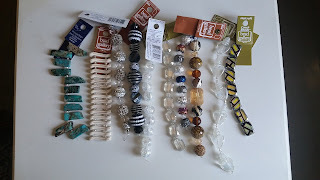 Getting ready to start my line of one-of-a-kind handmade #cocktail picks & #WearableArt necklaces! I'm so excited to get started, just waiting for some final supplies and materials. Keep an eye out for work-in-progress videos and photos! Direct Sales pages will be posted here! Payment will be via PayPal! My Not Quite SWEARY But Seriously SNARKY Adult Coloring Book is now live and for sale on Amazon! 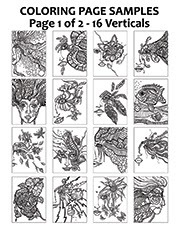 * 30 Beautiful, HAND DRAWN, SINGLE SIDED Coloring Pages! * 17 Vertical Images and 13 Horizontal Images. * There's even a coloring doodle on the "Book Colored by" page AND you can even color my portrait on the "About the Artist" page. * Skill levels are easy to moderately detailed. * Well defined boundaries to make it easy to "color inside the lines". 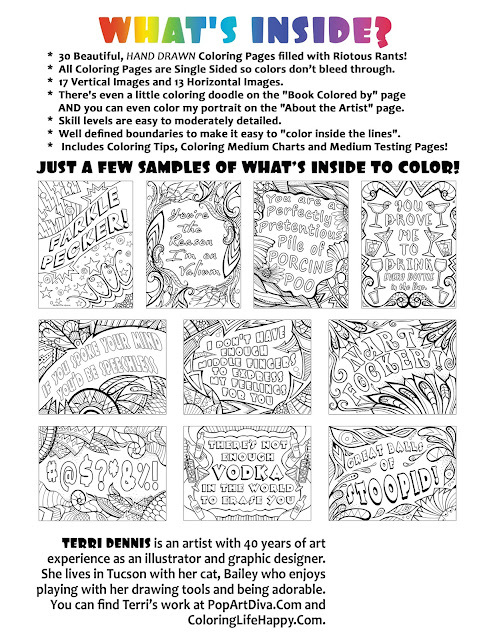 * Includes Coloring Tips, Coloring Medium Charts and Medium Testing Pages! 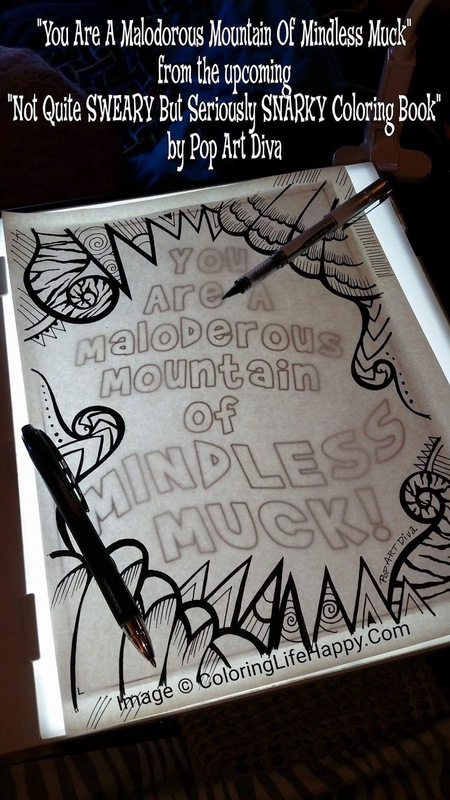 * Perfect coloring activity for when you want to cuss like a sailor but are too refined to do so. * SEND THEM OUT TO FRIENDS FOR A LAUGH or ENEMIES FOR RIOTOUS REVENGE! 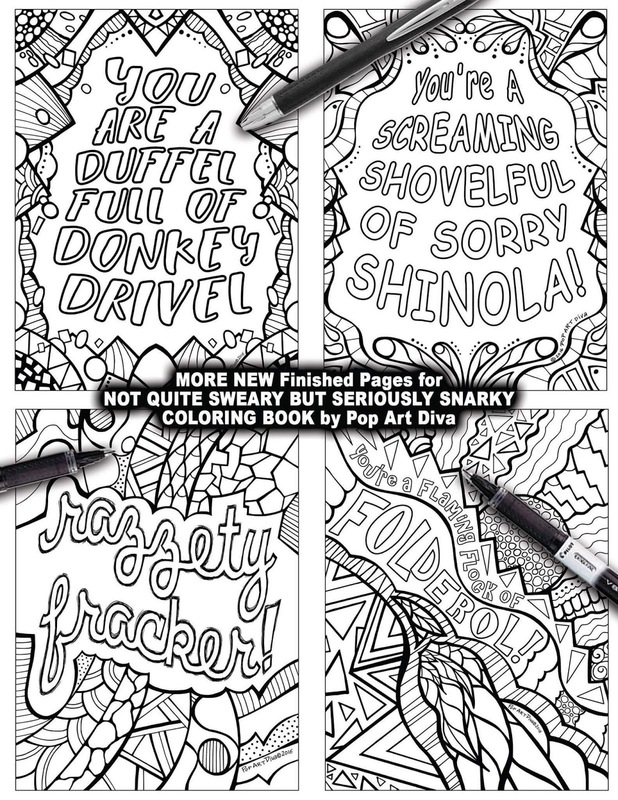 This is a coloring book for folks who might need to get some pent up feelings out but can't quite bring themselves to "swear in full color". Written with truly "colorful language" and illustrated with delightful detail to put a little color into your insults and dirty words. Bad mouthing has never been so beautifully silly - or fun. Get your aggressions out, grab your crayons, colored pencils or felt tip markers and speak your mind with a rainbow of almost potty mouth zingers, nasty put downs and sarcastic snipes. 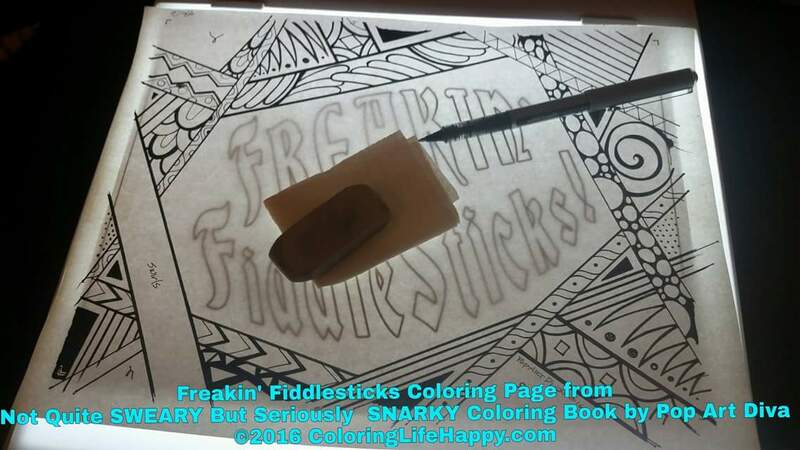 Enjoy the Naughty Nastiness, COLOR AWAY YOUR ANGER and May the Expletives Be With You! WORKING COVER FOR MY NEW SWEARY COLORING BOOK! 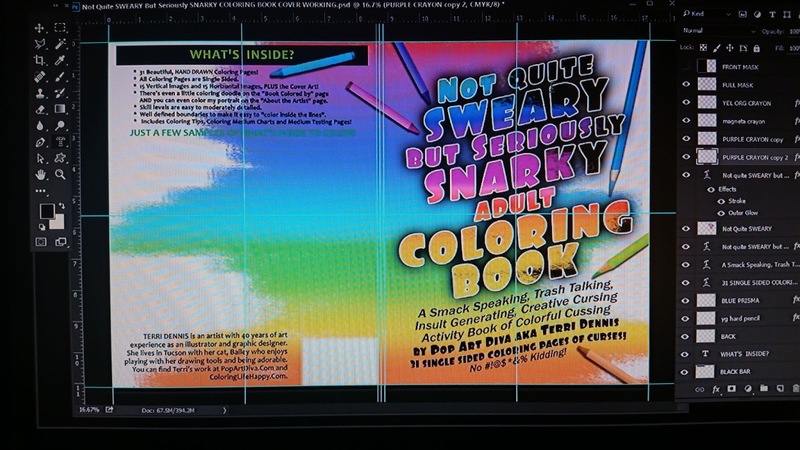 Working cover of my Swearing Coloring Book! 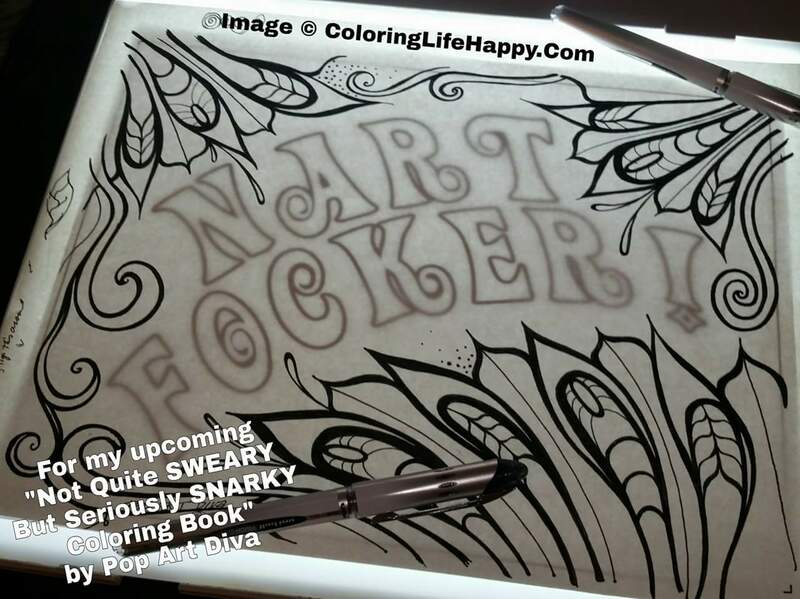 It's been a long few months working on my latest coloring book, the Not Quite SWEARY But Seriously SNARKY Coloring Book, but I'm in the home stretch! 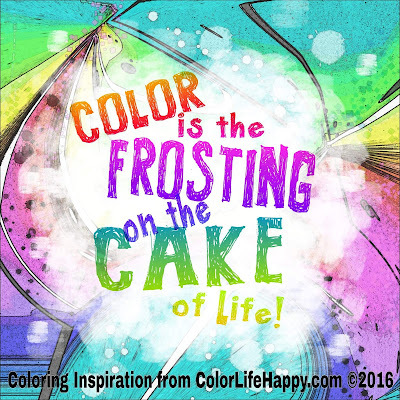 You can visit my Coloring Life Happy Facebook page to see the WIP (work in progress) videos of the many of the pages included in the book. Those videos will show you my working methods and illustrating style and give you some fun insights to my work day. Be sure to check out ALL my Coloring (& Cocktail Books) on my Amazon Author Page. 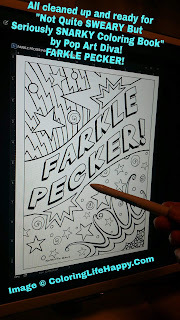 COLORING CONTEST from Pop Art Diva! 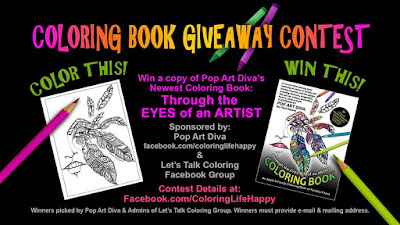 Win a copy of my latest coloring book, Through The EYES of an ARTIST Fantasy Coloring Book by Pop Art Diva! It's simple. All you need to do is go to the CONTEST PAGE and follow the directions. What's the prize? THIS BOOK! You have until this Friday, July 29th, 2016, to complete your coloring entry. What are you waiting for? 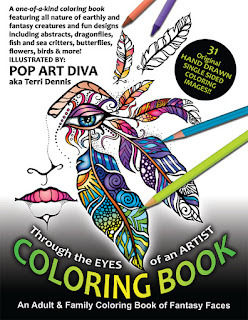 Grab those coloring pencils, markers & crayons and get coloring! I'm looking forward to seeing all the beautiful and entries. GOOD LUCK! 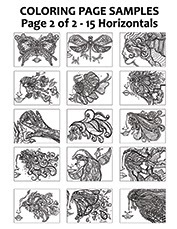 To view the 43 Work In Progress Videos of the Coloring Pages in this book, visit my Facebook page: COLORING LIFE HAPPY A unique, one-of-a-kind coloring book featuring women's eyes and faces morphing into all nature of earthly and fantasy creatures with coloring designs ranging from abstracts, butterflies, fish and sea critters, dragonflies, birds, flowers and even a skull and a cosmic view of space. All as seen "through the eyes" of an artist. 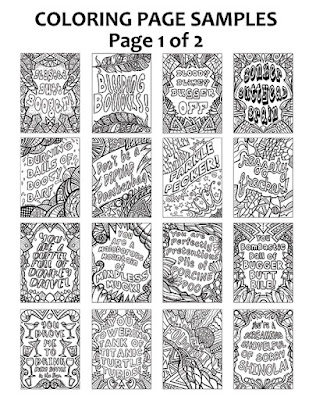 All of the coloring pages within this book are completely hand drawn. Done in ink, on paper and, in nearly all cases, directly inked with no preliminary sketching done. I did not use any digital drawing processes at all when creating these images except for the clean up stage where I corrected noogies (my word for mistakes or a slip of the pen.) You can even see progress videos as I drew many of the designs on my Facebook page at Facebook.com/ColoringLifeHappy. What does this mean? It means that these are not perfect, and they're not meant to be. Nothing hand-drawn is perfect and it shouldn't be. The whole point of not using digital drawing tools is to leave in the charm of the artist's imperfections and, at the same time, including a little piece of the artist's soul. I can, and do, create art completely digitally, I did for years professionally. Which is why I wanted to get the pen and the paper back in my hands again and sit down and draw the way I was taught to draw. 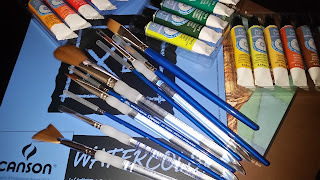 For me, personally, it is tremendously satisfying to have that physical contact with my art tools again. These drawings have given me many hours of artistic pleasure after having been separated from my art by bits and bytes for many years. I hope they bring equal measure of joy to you. I love drawing eyes and faces but not JUST eyes and faces. Heck, I just like to draw, but it's always more fun if I can let my imagination run loose and that is what I did with these drawings. I used what I call a direct inking process, no preconceived idea or design. Starting with the eyes and part of a face, I then let the drawing tell me what it wanted to be and, with pen in hand, happily followed along. If you are surprised by these designs, imagine my surprise at what ended up on my sketch pad at the end of an illustration session. It was great fun to see my menagerie grow as I created the book and I hope you have as much fun coloring the images as I did creating them. 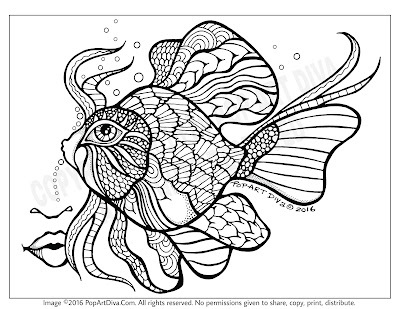 Here is my latest hand drawn, direct inked (no preliminary sketches), Zentangle Style Zendoodle Fantasy Face that turns into a fish coloring book illustration. I call it Fat Fancy Fish. As I have for this entire series, I started with the human eye. As I put the details and design in around the eye it started to look like a fish and so I continued with that and let it swim right onto my paper. This this was so much fun to draw that I have decided to do an entire coloring book of fantasy fish and other sea creatures in the future. 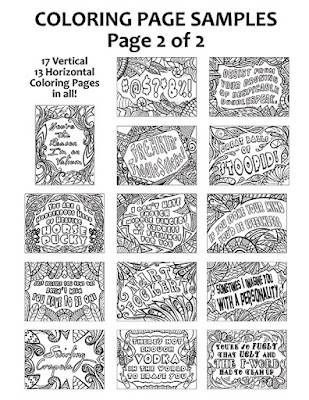 COLORING BOOK BLENDING TIPS, TECHNIQUES & MEDIUMS, Preserving Your Coloring Pages. 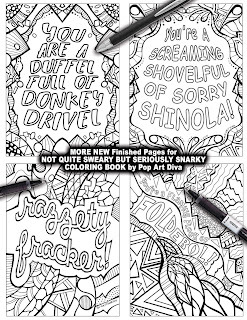 DO YOU WANT YOUR COLORING PAGES TO LAST A LIFETIME? There's a lot of discussion about ways to blend colored pencils on the coloring book pages and coloring forums on Facebook and the internet. Many of the posts I see talk about using Vaseline (petroleum jelly), baby oil, vegetable oil and other greasy home use products to blend colored pencils like Prismacolors. I've even seen nail polish remover suggested as a blending medium. Every time I see these suggestions I cringe. As a professional artist and illustrator of over 40 years I have always used archival procedures in producing all of my original art, whether it be a painting or drawing or any other original work. Petroleum products, oils and other household products that are not produced for use as an art medium can often damage the paper and the pencil pigments themselves, leading to eventual deterioration of the artwork. 1. Blending Pencils and Sticks. (Prismacolor Colorless Blender and theCaran d’Ache Full Blender Bright.) I use these most often with pastels as opposed to colored pencils, but they work for both. 2. Turpenoid, a solvent (a newer version of the classic artist's thinning and blending, but dangerous, turpentine.) Turpenoid is not completely safe and, like turpentine, presents certain health risks if not used properly and in a well-ventilated area, but the fumes are less severe than turpentine. This is my favorite liquid solvent to use as it evaporates faster than mineral spirits. I use it mostly for large areas and backgrounds. 3. Mineral Spirits, a paint thinner and solvent (Gamsol). Again not the safest blender healthwise, but way less odor than turpens. 4. The Icarus Art Board. This is basically a heat plate that will melt the medium as you work. Very pricey. As mentioned above, the turpines and mineral oil products do present certain risks of use, mostly from inhalation of the fumes but also they can cause allergic reactions if applied directly to the skin. There is also the risk of absorption through the skin. Be aware of these risks and take proper precautions if you must use these. Here is a great PDF comparison on the use and risks of artist solvents. Unless otherwise noted, all images ©2017 by PopArtDiva, ColoringLifeHappy.Com. All Rights Reserved. Image is for personal coloring use only. No permission is given to reproduce, copy, share, distribute this image or file except for up to three copies for personal coloring purposes only. No permission is given to post, email, print or publish for sale. All copyrights are legally enforced. By downloading images this you agree to these terms.